Here are links to the JavaOne pages, slide decks, and videos for the sessions I presented at JavaOne 2016. Occasionally I see mention of a “fail-safe” Iterator in Java. What does this mean? The context here is what happens when a collection is modified while it’s being iterated, or “concurrent modification” for short. Each collection defines its own policy for handling concurrent modification. Note that the issue is when the collection is modified directly, from “outside” the iterator. Modifying the collection via the iterator is generally permitted, with some specific exceptions. The term “fail-safe” is not used anywhere in the Java SE specification. Instead, the specification describes four different policies for concurrent modification: fail-fast, weakly consistent, snapshot, and undefined. The iterators returned by this class’s iterator and listIterator methods are fail-fast: if the list is structurally modified at any time after the iterator is created, in any way except through the iterator’s own remove or add methods, the iterator will throw a ConcurrentModificationException. Thus, in the face of concurrent modification, the iterator fails quickly and cleanly, rather than risking arbitrary, non-deterministic behavior at an undetermined time in the future. they are guaranteed to traverse elements as they existed upon construction exactly once, and may (but are not guaranteed to) reflect any modifications subsequent to construction. All mutative operations (add, set, and so on) are implemented by making a fresh copy of the underlying array. The “snapshot” style iterator method uses a reference to the state of the array at the point that the iterator was created. This array never changes during the lifetime of the iterator, so interference is impossible and the iterator is guaranteed not to throw ConcurrentModificationException. The iterator will not reflect additions, removals, or changes to the list since the iterator was created. The fourth policy, if it can be called a policy, is that nothing is specified at all. The results of modifying a collection during iteration are undefined and may result in inconsistencies. The examples here are the legacy collections Vector and Hashtable and their methods that return Enumeration, including Vector.elements, Hashtable.elements, and Hashtable.keys. If you iterate an Enumeration from the Vector.elements method, it’s not difficult to get odd behaviors such as elements being skipped, elements appearing twice in the iteration, or getting an exception unexpectedly. As an aside, when the Collections Framework was introduced in JDK 1.2, Vector and Hashtable were retrofitted to implement the new interfaces. For example, if you have a Vector, you can get an Enumeration using the Vector.elements method, or you can get an Iterator using the Vector.iterator method. The Iterator has a fail-fast policy, while the Enumeration does not. Hashtable also provides both an Enumeration and an Iterator, and only the latter has the fail-fast policy. What’s interesting is that Hashtable‘s Iterator and Enumeration are implemented by the same class which has a flag that determines whether it should behave as an Iterator or Enumeration. After all this, where does “fail-safe” come into the picture? Answer: it doesn’t. The words “fail-safe” are never used in the Java SE specifications that describe the concurrent modification policy of a collection. As such, there is no reliable, consistent definition of “fail-safe” for an Iterator. One can attempt to apply the general concept of “fail-safety” to an Iterator, but this is open to varying, misleading, and even contradictory interpretations. Don’t use “fail-safe” to describe a Java Iterator. Instead, use one of the documented policies listed above. If you squint a lot, this does kind of feel like you’re in Europe. Especially if you position yourself downwind of somebody smoking. My wife said this place reminded her of Downtown Disney. It’s true. If you peek around the corner, there’s the gigantic parking structure, and the intersection of Stevens Creek and Winchester Boulevards, each with six lanes of traffic and massive congestion so typical of California. The palm trees kind of ruin the Europe-like effect. I have to say, though, that this was a remarkably pleasant place to spend some time on a late Spring evening in California. This is mainly a reply to a Twitter conversation I’ve been having with Ken Fogel, regarding the performance of various List implementations. But it’s of general interest to Java programmers, and probably also to others participating in the conversation, so I’m posting it publicly here. Ken Fogel (Twitter: @omniprof) has posted some Java Collections Performance Benchmarks and is using the results to help guide what he teaches his students about data structures. Unfortunately, there are some issues with the benchmarks, which probably lead to misleading results. Our conversation has mainly been about the java.util.LinkedList class, particularly compared to ArrayList. I’ll therefore focus on those, leaving aside the other classes benchmarked there. Ken’s instructions were to click the buttons several times in order to warm up the JIT. The numbers bounced around a bit but I think the ones displayed here are representative. At first glance the numbers seem reasonable: element access in an ArrayList is uniform, and access to the ends of a LinkedList is fast whereas access to the middle is slow. The insert/erase numbers for LinkedList are similar. Something strange is going on with the insert/erase numbers for ArrayList. (The benchmark actually just does insertion.) Inserting at the beginning is the worst case, since the entire array has to be shifted down one position. Inserting in the middle should take about half that time. Inserting at the end should be cheap, since usually no elements need to be shifted. What’s going on? There are three issues that I want to discuss here. The first issue is in regard to general issues with Java benchmarking. The JVM’s JIT can easily invalidate benchmark results if you’re not careful. One of the most common problems is dead code elimination. A full discussion of these issues is provided in this article. In general, I strongly recommend writing benchmarks using JMH, the Java (Micro)benchmark Harness. It tries very hard to prevent the JIT from invalidating your benchmark, and it’s also quite rigorous at measuring and collecting data. The third issue is with the workload the code presents. The list is to be modified, so the pre-populated arrayList is first copied to arrayListX. Then, an element is added to arrayListX; that’s the operation that’s measured. This seems OK, but there’s more going on under the covers. The ArrayList class stores its elements in an internal array. If the array fills up, it’s grown by 50%. Thus, the typical case is for an ArrayList to have excess capacity at the tail end of the array. Arrays in Java cannot be resized, so “growing” an array really means allocating a new array and copying the elements into it. Naturally, this can be expensive. The benchmark populates arrayList by creating it with the default length of 10 and then adding 10,000 elements. The internal array ends up being reallocated a bunch of times, and it ends up with a length of 14,053. But all of this allocation and copying happens outside the benchmark timing. When an ArrayList is created using its copy constructor, the length of its internal array is exactly the same as the number of elements. So the new list arrayListX has an internal array length of 10,000 and it’s fully populated. When an element is added, an array of length 15,000 is created and the 10,000 elements are copied into it, along with the one added element. But arrayListX is then thrown away and a new instance is created, again with length 10,000. And again, the array is reallocated and copied when the element is added. This happens every time through the benchmark loop. I’ve taken some of Ken’s benchmarks and have recast them into JMH. I benchmarked ArrayDeque (AD), ArrayList (AL), and LinkedList (LL). I modified Ken’s insertion benchmark so that the same list is modified every time. This avoids the copying issue I described above. However, since we’re operating on the same list, we have to remove the element that was inserted. I’m calling the result an “edit” operation (although it’s really two operations). I also copied his “access” benchmark. Finally, like Ken’s benchmarks, I also did operations on the first, middle, and last elements, with the exception of ArrayDeque which doesn’t support operations in the middle. Ken’s benchmark also populated the lists using random words from a dictionary. I found that this caused a large amount of variability in some of the benchmarks, probably because of interference from garbage collection. I removed the dictionary and instead populated the lists with empty strings. This didn’t make any difference in the average results, but it reduced the variability considerably. I’ve created a gist with the code for my JMH-based benchmark. It’s pretty straightforward as JMH benchmarks go. One thing of note is that I’ve arranged all of the benchmark methods to return a value. This isn’t strictly necessary, but it’s good benchmarking practice. If you don’t return a value, the JIT has the potential to declare the entire method to be dead code (if, for example, it can determine the method has no side effects), and optimize it away entirely. JMH consumes method return values in a such a way as to prevent the JIT from doing that. We can see that many of the results are as expected. Access to the ends of ArrayDeque and LinkedList is quite fast, and access to any ArrayList element is uniformly fast. Access to the middle of the LinkedList is very slow. Editing the ends of the ArrayDeque and LinkedList is also quite fast. Editing the last element of the ArrayList is pretty fast. Editing the middle is somewhat slow, and editing the front is twice as slow. This makes sense, because inserting or deleting elements requires a lot of copying. The closer to the front of the list the edit occurs, the more copying is required, so the slower it gets. It’s slightly odd because we have to call previous() to cue up the element for removal. However, as you can see from the benchmark results, this performs only one traversal instead of two, making it twice as fast as the LL_editMiddleIndx method, and it’s in line with LL_accessMiddle. I and a few other folks on Twitter have been making the case against LinkedList. For example, at one point I said that “LinkedList is much less useful than people think.” (tweet) I think the benchmark results I’ve presented here bear this out. Looking at just these operations on ArrayList and LinkedList, there are clear tradeoffs. Element access in ArrayList is faster, but editing potentially involves copying O(n) elements, which can be expensive. Many people claim that LinkedList has the advantage for editing operations because they are O(1). This is true, but only at the ends of the list, or if you already have the location in the list where you want to do the editing. (Such as with a ListIterator.) If you have to search for the location, or if the index is somewhere in the middle, you have to pay the traversal cost to get to that location. The kicker here is that traversing through a LinkedList is considerably more expensive than copying the elements of an ArrayList. If we assume that the edit location is uniformly distributed within the list, the average cost of element copying in an ArrayList is around 0.9µs. For a LinkedList, however, the average cost of traversing to a location is over 4µs. There are clearly workloads where a LinkedList will outperform an ArrayList. However, in many cases, the traversal cost of the LinkedList is so much more expensive than the copying cost of the ArrayList, it more than offsets LinkedList‘s O(1) advantage in editing operations. That’s why I claim that ArrayList is usually preferable, and LinkedList should (almost) never be used. News flash! JEP 277 “Enhanced Deprecation” has been posted. 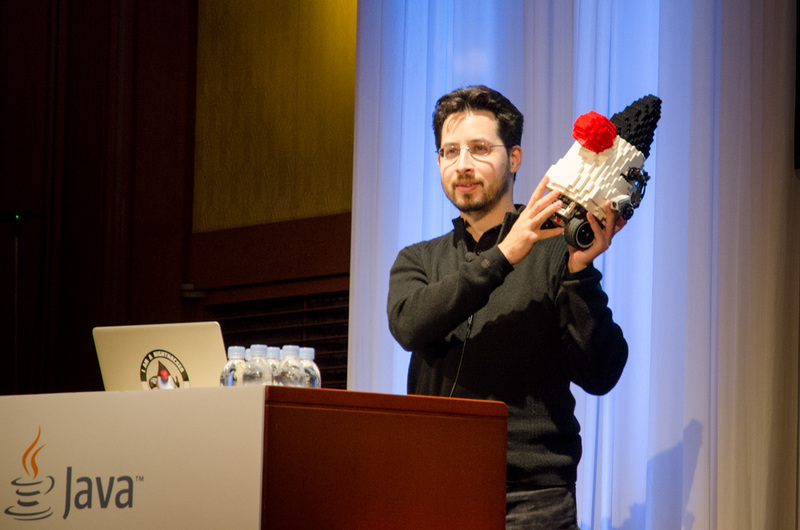 Since this year’s Java Day Tokyo 2015 is about to happen, I figure I should post my article about last year’s event. Unfortunately I won’t be able to attend this year. But last year I traveled to Japan for Java Day Tokyo 2014 and for a Japan Java User Group event. The trip was packed with events. I brought my family along with me, and fortunately we did have a couple days to travel around Tokyo to relax and do some sightseeing. 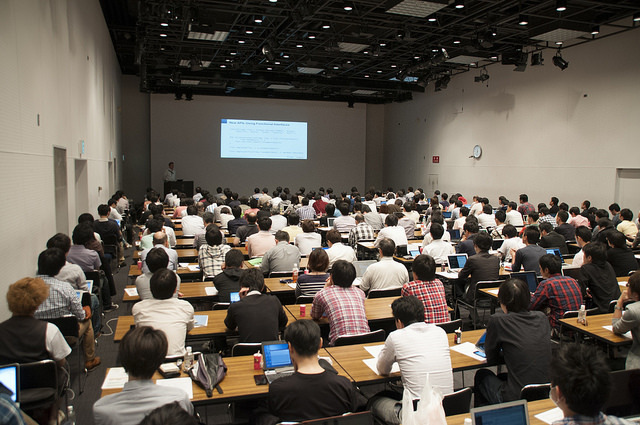 The first event was the JJUG CCC Spring 2014 (Japan Java Users Group, Cross-Community Conference). This is a twice-per-year gathering of several JUGs from around Japan where they stage a full-day conference. 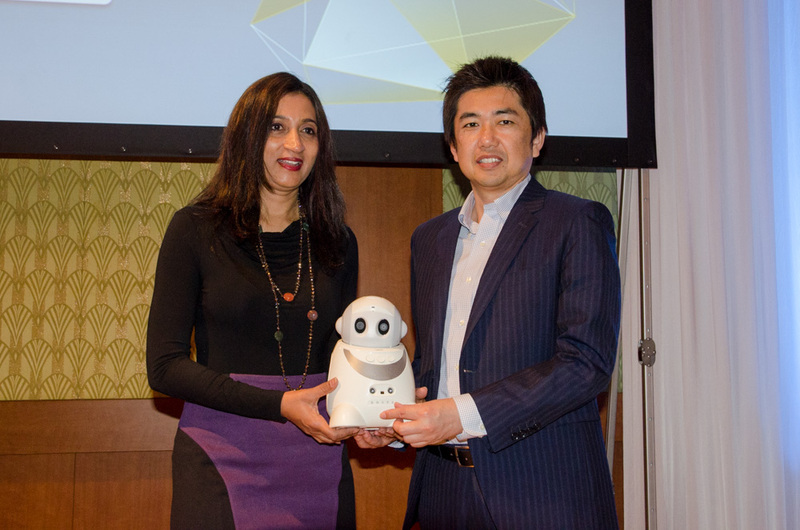 It turned out that I was one of the keynote speakers! I was told there were over 300 people attending, making it one of the biggest JJUG events ever. Wow, I’m honored. My presentation was Overview of Java 8 Lambda and Streams, which covered not only those topics but also default methods and method references. That’s a lot to cover, and I couldn’t go very fast because I had to pause after every sentence for consecutive translation. Still, people said they enjoyed the presentation and that they found it helpful. 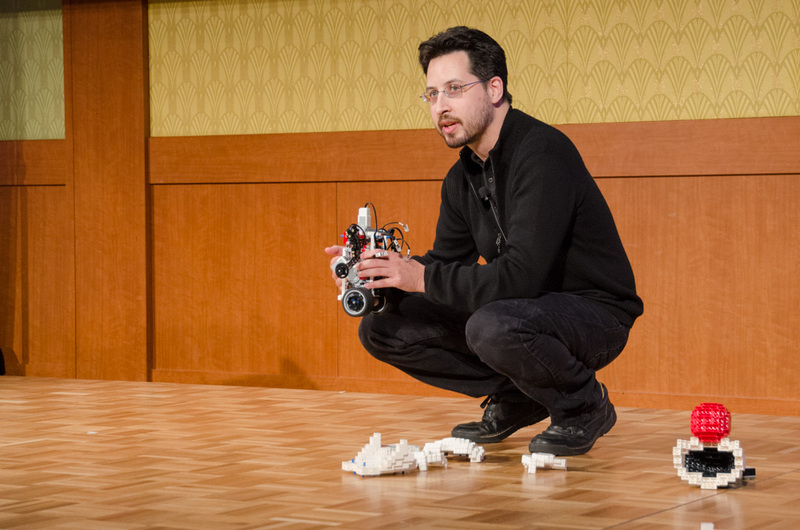 Yuichi has posted a Flickr photo set of the entire event, including a few more of me. This was the main event. It was jam packed with sessions, including a set of keynotes in the morning, and five tracks in parallel in the afternoon. Here’s the agenda, and here are slides and videos from the subset of sessions that were recorded. 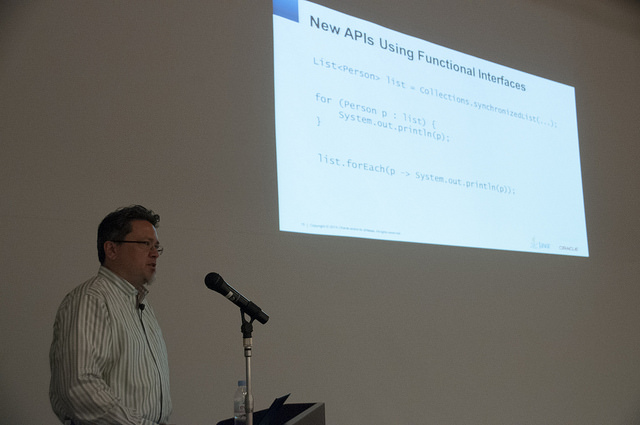 I had two sessions in the afternoon: the first on Java 8 Lambdas, and the second on Java 8’s new Streams API. Here are some pictures I took during the keynotes. That evening after a full day of sessions, there was a two hour “Ask the Experts” panel and I was on the panel. David Buck (Oracle JVM Sustaining) was pressed into service doing consecutive translation in both directions between the audience and the panelists. I think he did quite well considering he’s not a professional translator. Not surprisingly (as Java 8 had just been released) most of the questions were about Lambdas and Streams. There were some pretty good questions. One question asked about some details of how lambdas are implemented. I replied that I’d try to be brief and hold my remarks to under half an hour. That got a laugh out of the audience (a Japanese audience — a first for me!). David did pretty well translating my answer, until I got to the part about the “lambda metafactory.” I’m not the real expert at this, though. Brian Goetz is, and he’s given a talk called Lambda: A Peek Under The Hood that explains the lambda implementation in great detail. Like most labs, after a brief introduction, most of the participants went heads-down and worked steadily on the problems. They must have been pretty good problems, since most people were still working on them when we ran out of time! I’m sad to be missing this year’s Japan event. Make sure you go if you get a chance. It looks like it’ll be as good if not better than last year’s!